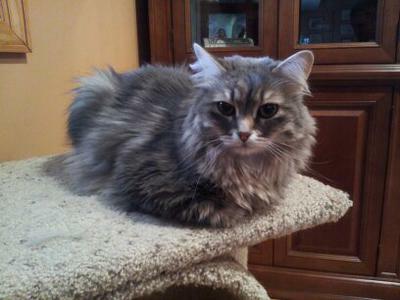 Sasha, a pure Siberian cat that was taken from us at too young an age; only 2 1/2 yrs old from Cancer. She was a true companion. Would follow you around the house, and snuggle on the couch. Her greatest skill was hunting down any insect that made the mistake of entering our house. In a deep sleep across the room she would wake up and pounce on the unsuspecting insect! She was a loyal friend, she will be truly missed. Taken from us too young. So very sorry; it is always hard to lose them. I'm sorry to hear about Sasha, Kevin. She was so young. RIP little cat.